My goal this summer is to be more intentional with my children and my family. Honor the good times, make moments special. Turn simple things into events. Create memories and traditions. We have always loved watching movies, a lot. Like a lot, a lot. But this past weekend we made our family movie night into an event. I recently learned about a company called Mommy Bear Media--a great place for family friendly movies. I was invited to write reviews of some movies this summer. Movies we get to choose, so it's a really fun assignment. A couple weeks ago, my kids fell in love with the classic The Sound of Music, which I couldn't be more thrilled about. I mean really, how great is it that they go around singing "Favorite Things" and "So Long, Farewell" everywhere? And I mean everywhere. Even baby Wade sings the "cuckoo" part of the songs. Loving that my kids liked a very old classic movie, I picked out another gem from the very old classic vault: Pollyanna. They would fall in love with Hayley Mills, I was just sure of it. I had visions of the kids and I sitting around playing The Glad Game when life became hard or unfair. It all started out so wonderfully. Early in the day we began with our movie night event planning. Lucy and I brainstormed ideas and what we needed to do. Lucy made it clear who all ideas had to be "run by" first before proceeding. 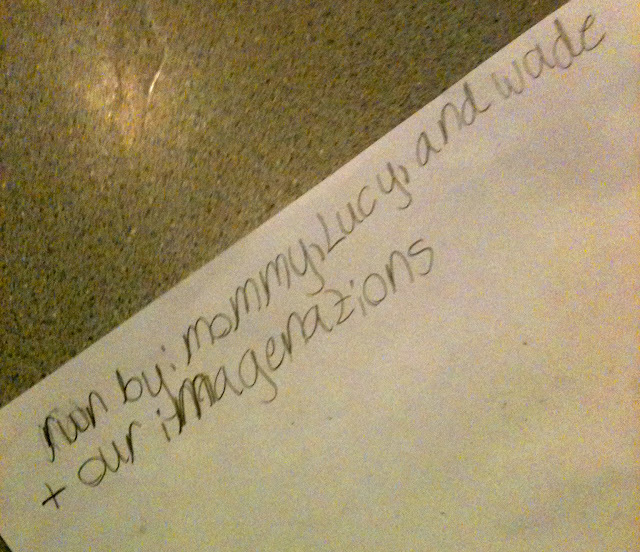 "run by: mommy, Lucy and wade + our imagenations." Not everything went exactly how we planned of course. It was a scene right out of the movie they were about to watch for the first time. People coming together to make something happen, to make something better. We don't have a special screening room and sure our TV isn't flat or extra large, but our movie night was going to be something special. Was I setting the expectation too high? Probably. Would the kids love the movie I grew up quoting and loving? Maybe. The stage was set. We had a movie theater name and sign, a concession stand, a ticket booth and tickets. Love the name the kids came up with for the concession stand. Here's the thing about old classic movies, they are long. Thank god we had a pretty stocked concession stand because the kids were antsy through the movie and frequenting the stand for snacks and drinks. Pollyanna is the story of a young orphan who goes to live with her rich aunt in what just might possibly be the grumpiest town ever. She melts hearts and changes lives with her kindness and positivity. But of course, she has a tragic accident and is faced with some harsh realties of her own. 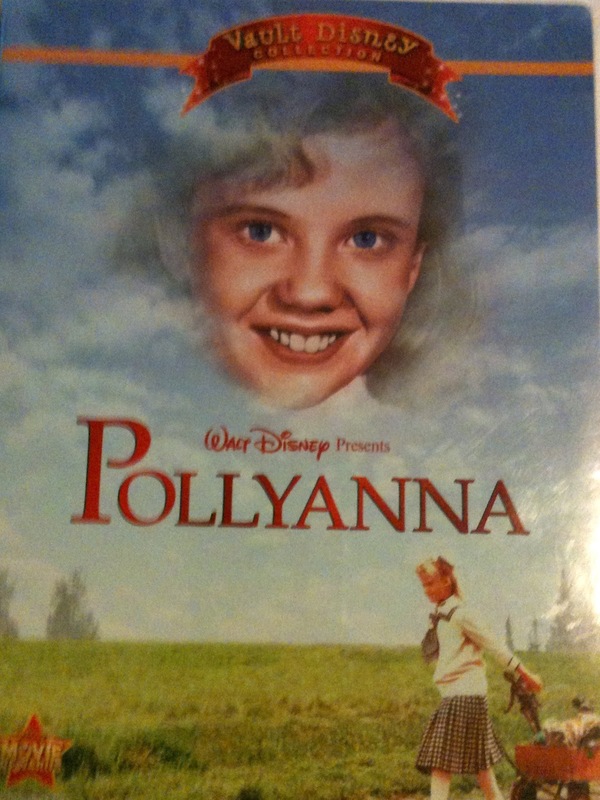 As I watched the movie, admiring Pollyanna's resilience and refreshing honesty, my kids weren't feeling it. "She's kind of annoying,"my normally sweet 8-year-old daughter said. I'm not going to lie, it stung a little. How could she call Hayley Mills annoying? While I enjoyed Pollyanna's "choose joy" message, I wanted more. Maybe it was because I'd seen it before. Maybe it was because I'm older and wiser and more compassionate (I'm going with this one). But I wanted to know exactly why Aunt Polly is so grumpy and afraid to let her guard down. And why she tells Pollyanna not to speak about her recently deceased father. What's her beef with the dad? The movie brought back some very sweet memories for me and introduced my kids to The Glad Game (finding something good in almost any situation), but toward the end I felt like the kids were watching it as a favor to me. It is dated. It is long. But I can't give Pollyanna a bad review, c'mon that just isn't right. If I were going to play the Glad Game, I would say it was a wonderful night with the whole family together. And since the movie, my kids have been calling each other "scare baby" and "snitch baby" two names Pollyanna uncharacteristically calls people in the movie. Which my kids thought was hilarious, brings them great joy and isn't too harmful. Now that we have the theater props, we look forward to the next family movie night. And I think I will choose something a little more current next time. Take a look at Mommy Bear Media. In addition to their website, you can follow up with them on Facebook and Twitter as well. What a fun and creative idea for a movie night! Thanks for the post! I do understand your feelings on the kids not enjoying the movie. I recently had my kids watch Mr. Holland's Opus with me when I caught it on cable. They just did not appreciate it (other than I let them stay up later than normal to see it). I cried like a baby at the end, and the kids looked at me like I had 3 heads. Kids are funny little persons aren't they... LOL!!!! I'll have to check that website. Thanks! !